George Phineas Gordon was born on 21 April, 1810, in Salem, New Hampshire, where his family had lived for more than 150 years. He was the second son of the merchant Phineas Gordon (1781-1850), and Mary (White) Gordon (1780-1852). The family had seven children: Louisa, Mary, Cuthbert, George, Wealthy, Adeline, and Edward. Phineas Gordon was fifth generation heir of the early settler Alexander Gordon (Gorthing) (1630-1697). Alexander was a young Scotsman, a soldier in the Scottish army of 1651, which came into England with the design to place King Charles II on the throne, but was captured at the Battle of Worcester, became a prisoner of war, and with several thousand of his countrymen, was held in prison camp. In 1652 300 of these Scotch prisoners were selected for transportation to New England, where they would be sold to planters and mill owners, the usual terms prevailing as to price and length of service (six years). In New Hampshire Alexander worked as a miller, planted and farmed, and raised his family. George Phineas Gordon was educated in Salem, NH, and in Boston, Massachusetts, where the family lived in 1820s. After leaving school George became an actor for a short time, but failing to achieve a livelihood at this, in early 1830s he moved to New York, where he became an apprentice printer. Upon learning the trade, Gordon opened a job printing shop of his own, and around 1834 he began to experiment in press design. In the middle 1830s he is recorded as inventing a speedy card press, but he got his first patent (US patent No. 7215) for a printing press (it was a job-press—a relatively small press, called also jobber) as late in March, 1850, and manufactured it as the "Alligator". It had many flaws, and was soon replaced by the "Yankee", then by the "Turnover" (patented in August, 1851), and then by the "Firefly", which could produce 10000 printed cards an hour. 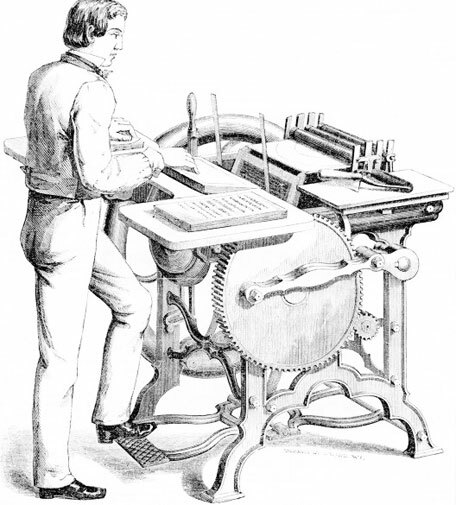 In 1858 he introduced the successful "Franklin" press (Gordon was a spiritualist and claimed that Benjamin Franklin had revealed the basic design of the press to him in a dream, but actually the "Franklin" press was based on previous inventions), which has ever since been known as the Gordon Jobber. The "Franklin" press (see the upper image) was strong, well built, and easy to operate machine. It solved the problem of clam-shell presses (which previously had "snapped" and endangered pressmen's fingers) by having the platen open on cams, so that it was flat and lagged for the pressman as he fed the sheet, before closing parallel to the type bed. Gordon ultimately built more than 100 kinds of presses. Initially his machines were made for him by outside machine shops. 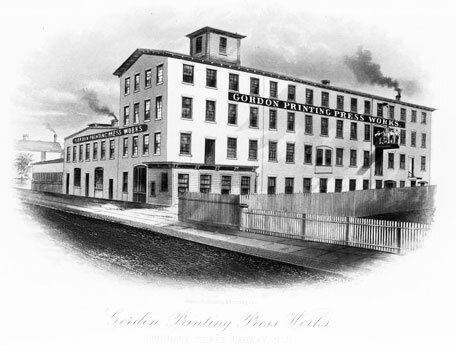 At the height of the Gordon Jobber popularity, however, in the second half of 1860s, he decided to began manufacturing presses himself. Thus he established a workshop in Rhode Island, and in 1872 he built his own factory in Rahway, New Jersey (see the lower image), with a capacity of 600 presses a year. The factory closed down in 1909. George Phineas Gordon was twice married. His first wife was Sarah Elizabeth Cornish (1824-1851). They married in 1846, and had a daughter, Mary Ann (b. Sep. 1847 in New York), but Sarah died only 26 years old, on 5 Apr. 1851, in New York. Later Gordon married to Lenor May (b. 1830 in Connecticut). 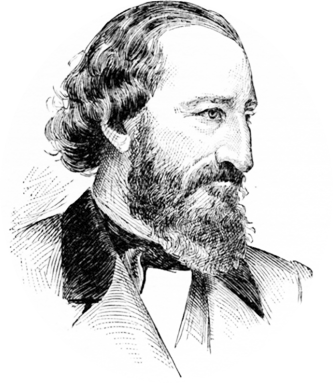 George Phineas Gordon died of disease of the heart, on 27 January, 1878, at his residence on Freemason street, Norfolk, Virginia, and was buried in Green-Wood Cemetery, Brooklyn. Gordon left a fortune that was estimated at almost a million dollars, a huge sum for the time. His will was known to exist, but it took his family twelve years to find it. His real legacy was a printing press that became almost universal in printing offices for a more than century. He even devised a simple adding device (see the adder of Gordon).